Matsunoyama town has almost everything its residents could want: spellbinding scenery, gorgeous terraced rice paddies cloaking the hillsides, splendid new roads and magnificent public facilities. That is, everything except young people, and hence a future. Over the last four decades the small town in Niigata prefecture has seen its population plummet from over 10,000 to around 3,000 today. It’s an old story in rural villages and towns over Japan; the pied-piper call of the big city luring away the community’s young people, leaving behind an ever more aged population. Of the town’s residents now, more than 40 percent are of retirement age. And the exodus continues. The oldest residents pass away and the youngest pack their bags for the city; 3,400 left in 1995, five years later another 300 had disappeared. So says Shingo Okano, 38-year-old owner of three Tokyo onigiri restaurants and occasional rice farmer. He tells how several times a year he and a few staff make the long car journey up to his restaurant’s tiny Matsunoyama rice field. 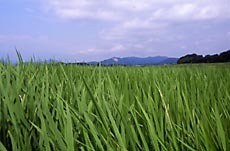 Okano and his staff work their paddy field by hand under the supervision of a local farmer. Last year they celebrated their sixth harvest; friends from Tokyo sometimes tag along, and even a handful of local youths have shown interest. Susumu Yuzawa of the government funded Rural Depopulation Research Association says that Okano’s project is part of a growing interest in rural life; some young people are even upping sticks for the sticks. The association has a Web site to help people who want to relocate to the countryside, which had around 30,000 hits last year. The convenience of online information about jobs and rural villages has provided a recent boost to the movement, although government and local authorities have been encouraging young people to move back to the country for years. Whether out of choice or necessity, young people are beginning to look at work in a different way. A survey of university students due to graduate this year conducted by DISCO job agency found that only 31 percent plan to work for the same company until retirement age. A far cry from the days when white collar workers aspired to (and could often expect) lifetime employment. But is the countryside ready for large numbers of young people looking for an alternative life-style? The “I-turn” movement (moving from the city to the country) and the “U-turn” movement (people from the country heading to the city, then back again) have been around since the 1980s. However, the things that discourage more young people from moving to the countryside are the same as ever. England-born Paul Christie lives with his wife, Mari, in Otamura, a small village on the Kunisaki Peninsula in Oita. He’s a member of the I-turn club in his village, a group of around 50 people. A survey by the Rural Depopulation Research Association in 2000 found that “company work” is the most popular choice for those that have already moved to the countryside. In other words, they avoid the shortage of work by commuting to the city. Relatively few work in the government construction industry, which plays a major part in the rural economy. Other U-turn and I-turn employment ranges from tourism to geriatric care to traditional crafts. With the help of the help of the organization, local governments try and match jobs to candidates; but the right work isn’t always available, and sometimes idealism isn’t enough to persuade young people to give up city salaries. But the Japanese country needs help from somewhere. In a 2000 survey, more than a third of Japan’s municipalities were classified as depopulated more than half Japan’s land area. All had lost more than a quarter of their residents since the 1960s. Of the traditional rural work that remains, one branch drawing attention at the moment is forestry. Although the number of forestry workers has been dropping overall since the 1960s, interest among city youth is growing. A 2000 survey found that a quarter of new forestry workers had relocated to the country from the city. Last year over 5,358 people turned up to seminars on forestry work held in cities over Japan. Organizers expect even more to attend an expanded set of seminars this year. Paul Christie believes that tourism could be crucial to the future of his village, bringing in new visitors and new residents from the city if only it’s handled sensitively.